Majestic grand manor house, offers the discerning property buyer a range of possibilities. Options include creating the perfect family compound, corporate retreat, aesthetic clinic or health hydro. It's a rare opportunity for the visionary investor. This exceptional property features a Cape Dutch homestead, en-suite accommodation, conference facilities and a Wellness Centre with luxurious spa facilities. The spa complex has indoor and outdoor swimming baths, sauna and steam room, treatment rooms and a modern gymnasium. The Manor comprises of spacious accommodation to sleep 20 people comfortably, extensive reception rooms, a professionally equipped kitchen, swimming pool (indoor and outdoor) and a host of features unique to a property of this calibre. 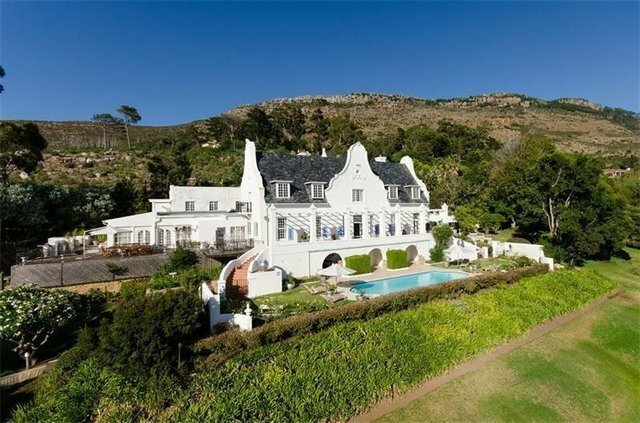 The Manor is set in a four-acre estate within the exclusive suburb of Zwaaanswyk, which is situated in the Constantia Valley of Cape Town. This private and secure property is positioned against the Constantiaberg Mountains and offers sweeping views over the valley and forest towards False Bay. The estate is bordered on two sides by the magnificent Steenberg Golf Estate.